Allergies are the result of an exaggerated physical reaction by the horse's immune system to normal substances in the atmosphere such as dust particles, mold or fungal spores, pollen, insects, and chemicals used in horse related products. When confronted by these allergens, the horse's body produces antibodies that cause changes in the body, thereby producing symptoms and signs of the allergy. Allergies are related to many normal substances in the environment including sensitivity to inhalants produced by pollens, grasses, weeds, shrubs, molds, oats, wheat, barley, corn, and barn dust, as well as ingredients in commercial horse foods. Certain foods, feeds, grains, hay varieties, and nutritional supplements may trigger allergies. Other causes include reaction to chemicals in tack supplies, insect saliva, and products used in the stable area. Skin allergies are often caused by insect bites resulting in hives or welts as a result of the build-up of proteins called antibodies. 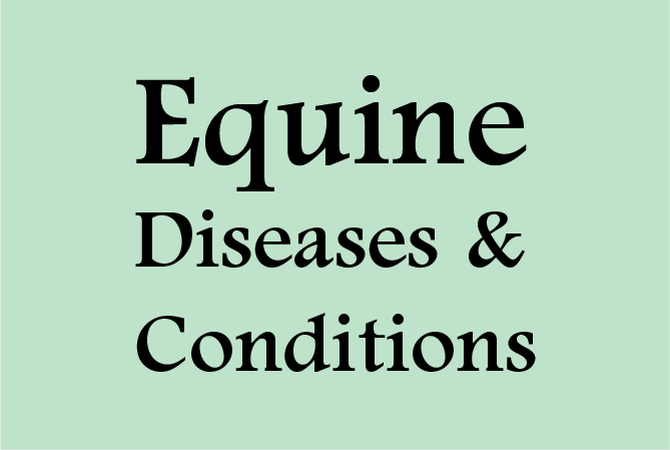 Horse allergies can take years to develop. Undetected allergies are difficult to prevent and diagnose initially. If a horse has a healthy immune system, fighting off allergens will be easy, but, if the immune system is compromised in any way, allergies can become a serious problem. Keeping the environment clean and insect free, and changing the bedding often is key to preventing allergies. Hay, grain, and bedding are major sources of mold spores and particles in the barn air. When possible, store hay and bedding in a separate building rather than in a barn loft or area. In some cases, using shredded paper or rubber mats for bedding will help prevent or resolve allergy problems. Elimination of foods that cause allergy symptoms, and following a recommended diet for horses with allergy problems is helpful when food allergies are involved. The best form of treatment is avoidance of the offending allergens, although In reality, this may not be possible. Some allergies naturally dissipate with time, but steroids and other drugs are often necessary to counteract the unpleasant symptoms and effects of allergies. If the use of drugs is necessary, the horse's condition should be thoroughly evaluated by a veterinarian before the treatment is started. Prolonged use of drugs can have serious side effects, so proper testing to determine the source of the allergic reaction is important. Having ruled out other possible maladies, blood may be drawn and sent to a laboratory for diagnostic evaluation. The horse's serum will be tested for sensitivity to a number of possible allergens including grasses, weeds, molds, pollens, barn dust and a number of food types and ingredients used in horse food preparations.